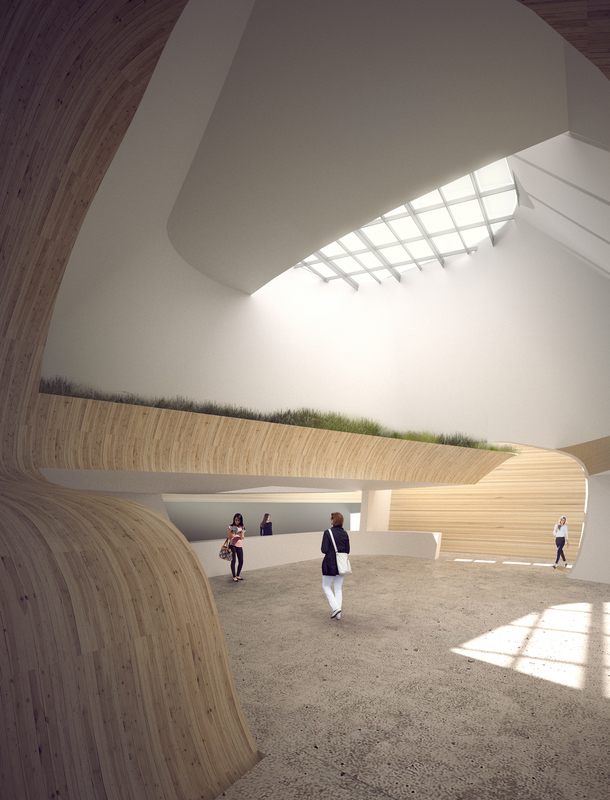 [Glacier] reimagines and intensifies the program of a museum through layers of landscape and natural light, producing an iconic cultural landmark for the port city of Helsinki. These layers develop a rich, fluid experience that contextualizes the museum at multiple scales within the physical and cultural fabric of Helsinki and Finnish culture. The design supplants the typical iconic object building, which is visually discrete and compartmentalized, with a new icon that melds into the culture of the city. 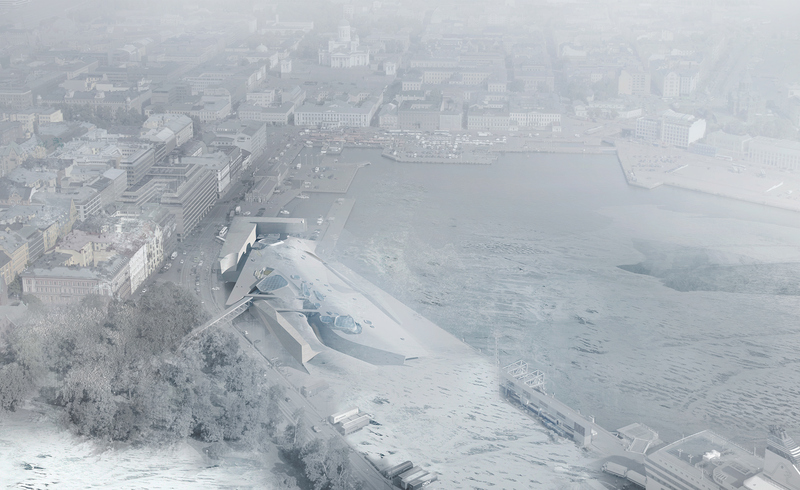 [Glacier] redefines the cityscape as an urbanized landscape and redefines the context as an extension of the museum. 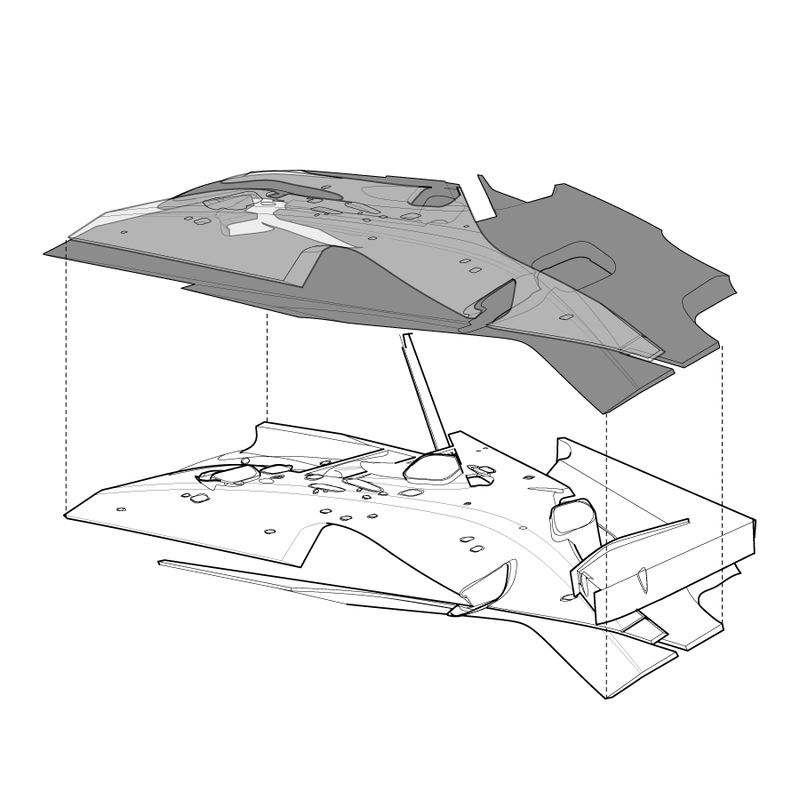 The site strategy articulates the unique qualities at each of the museum's corners, integrating the new building within its marine context. Helsinki’s port and historic urban core are reimagined by the building massing, which defines and simultaneously blurs the edges where city, park, port, and water meet. At a regional scale the project connects the museum to Helsinki’s “green fingers” by blending the new ground with Tähtitornin vuori park to the west and conceptualizes the roof as part of this extended archipelago. At a national scale the project evokes a Finnish ethos, manifesting the nation’s emotional connection to the natural landscape that is bathed in a sublime light. 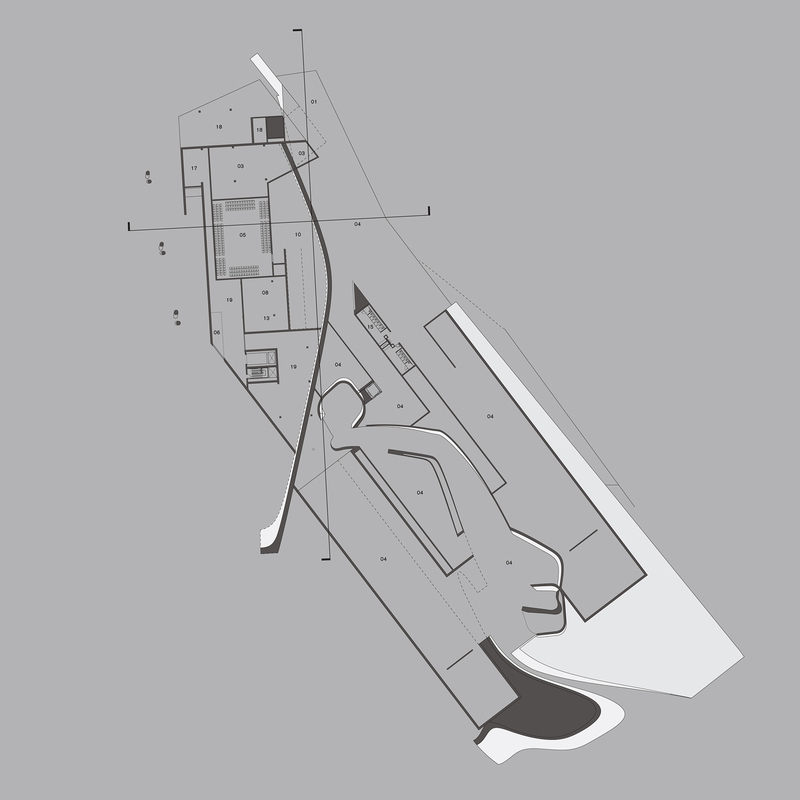 Internally the museum is organized around a central public core that efficiently organizes a majority of the program and increases the potential for vistas through adjacent programs and to the site beyond. 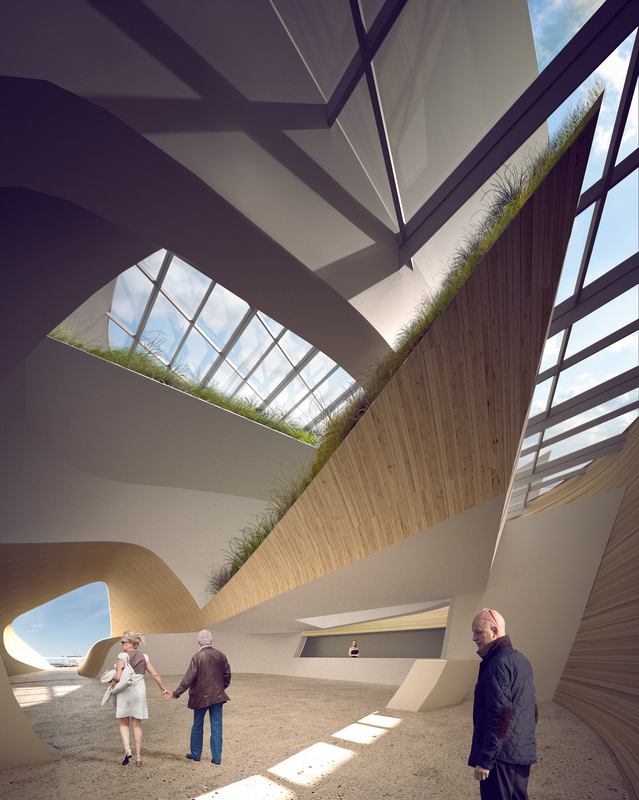 This core contains the main atrium where guests will find Visitor Services with views back to the port, providing an orientation within the site. 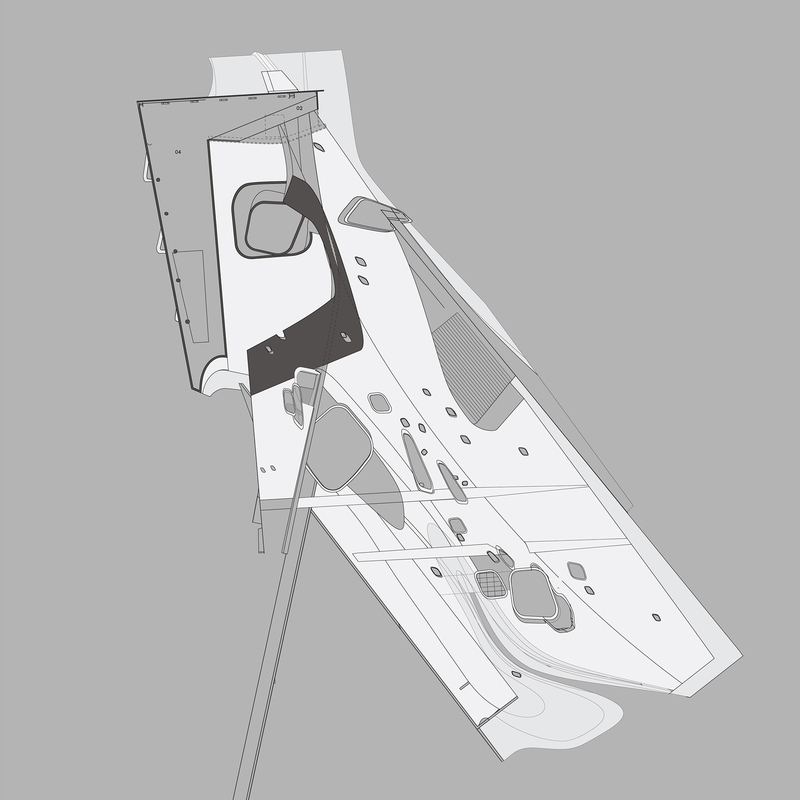 The main atrium can be reached through multiple entrances, which begin the smooth transition from exterior to interior space. Visitors arrive at the main entrance from the vehicular drop-off along the northern edge defined by Eteläinen Makasiinikatu. From there they travel up a gentle slope where they are visually connected to the Museum Gift Shop and to the Café along the water’s edge, both of which can be accessed from the ground floor. This procession from the ground up to the newly elevated landscape situates one within the heart of the building. Another entrance connects Tähtitornin vuori park from the west via a bridge across Laivasillankatu to an elevated sculpture plaza; this conceptually extends the new art landscape into the existing park. This plaza can also be reached via a grand stair from the new pedestrian/bike path along Laivasillankatu. The plaza provides opportunity for sculptures to be viewed prior to ticketing and provides new outdoor opportunities for events within the site. The final entrance faces east and connects the port terminal along a new boardwalk where visitors have the option to gently walk up to the upper level or to continue on the quay to the north, passing the café and several galleries along the way. The southern part of the building houses the majority of the galleries, which are accessed via a circulation through a series of smaller atria that dissolve the interior and exterior thresholds. 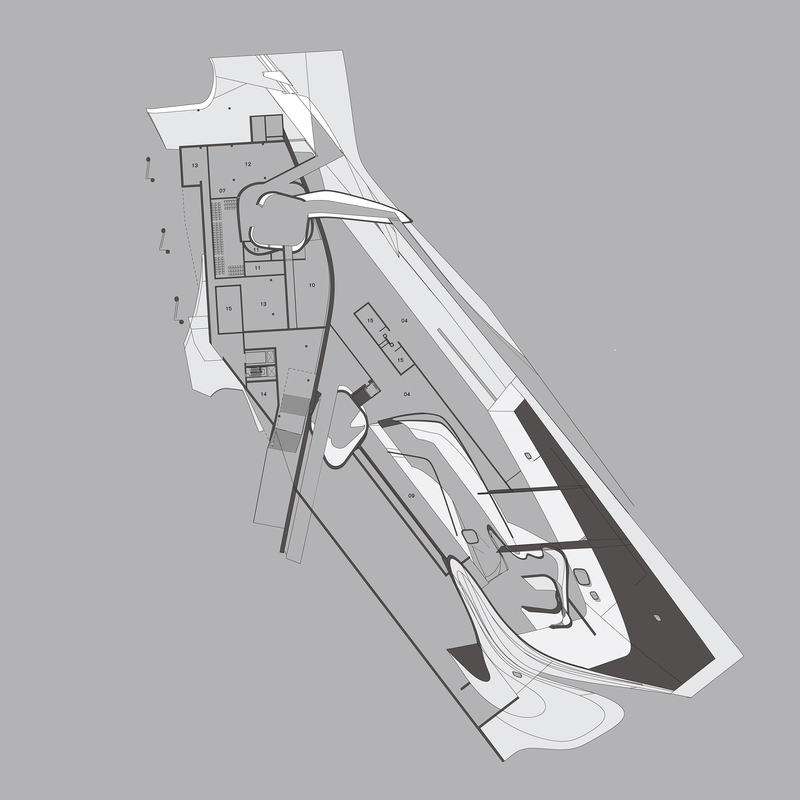 The active landscape organizes the museum into a series of flows connecting the interior and exterior of the museum with the city. This strategy acknowledes the Finns' deep cultural relationship to nature and provides passive, sustainable strategies to increase the buldings thermal mass. The new landscapes collect rainwater, provide cleaner air inside the museum, and present art within a new organic context.